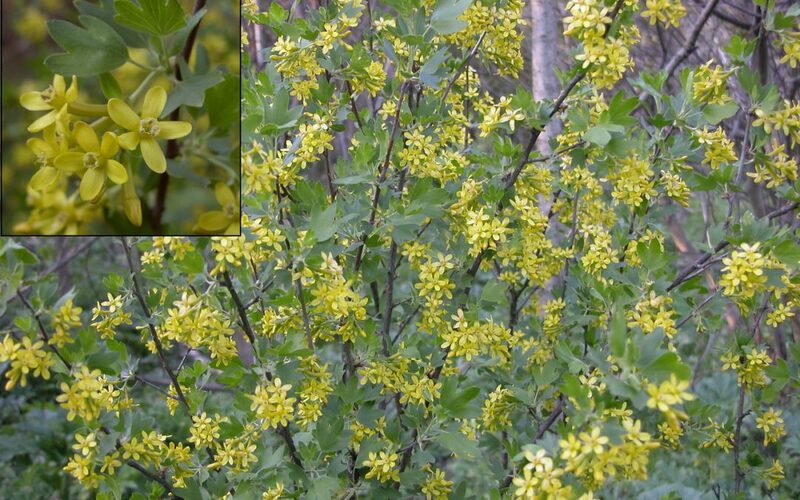 As the seasons begin to change and the signs of Spring appear in the landscape, be on the lookout for a remarkable shrub with small, fragrant yellow flowers: the Golden Currant. A native to New Mexico moisture catchments at elevations from 2,500 to 8,000 feet, this plant is suitable for many Albuquerque landscape situations if sited and cared for properly. A standout in terms of multi-season interest, fragrance and wildlife garden value, Ribes aureum has few botanical peers. In late Spring, five-petaled flowers – with a scent said to resemble the aroma of cloves or vanilla – attracts hummingbirds and monarch butterflies. The flowers develop into edible currants, a favorite of birds, which by June will mature from a red color to deep blue. Small green leaves turn a bright red in autumn before falling. Tips for success: Golden Current may succeed in sunny or shaded locations, but will require less irrigation (link to new Efficient Irrigation Consultation tab) in lower elevations if sited in at least partial shade. However, it is likely to fruit most heavily in sunnier locations. Golden Current is adaptable to a wide range of soil types, but is not tolerant of salt. It also benefits from a substantial layer of organic mulch for moisture retention. Water every few weeks in summer. It may try to spread via suckers so be careful when choosing a location. A useful specimen in any edible or wildlife garden, Ribes aureum is also suitable for the edge of a rain garden or beneath a shade tree. Grow it for its ornamental properties or simply for the fruit, which can be eaten raw or used in juices, jams or pies.